Available for those that can afford it. The Mongolian rocket launcher resembles a wooden, fire-spitting demon-wagon. 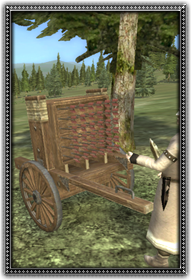 Inspired by the rockets fired at them during the invasion of China, the Mongols have fiendishly mounted 36 of them on one frame. Although very inaccurate, the rockets are fired in a great barrage capable of hitting multiple units simultaneously.